There is nothing worse than staged, stale and forced nationalism. When it has to be encouraged, or cajoled out of a crowd of people, it is one of the ugliest sights around. However, the flip side of that is that when it comes naturally, when a group of people with a common thread come together and let their emotions and passion get the better of them, it can be awe inspiring. 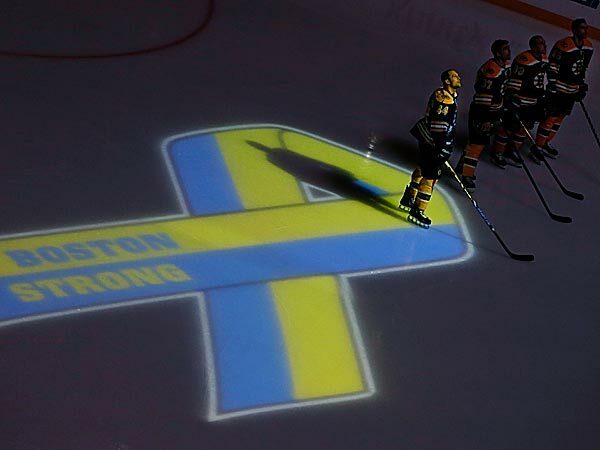 The Boston Bruins got back on the ice last night for the first time since Monday's Boston Marathon tragedy. The atmosphere in the stadium pre game was electric, a passionate crowd ready to let their emotions out in the open. A very respectful silence greeted Rene Rancourt as he started the anthem before the game. The Bruins went on to lose in a shootout to the Sabres. It was always going to be a tricky game for Boston, with so much emotion running through the building. On top of that, the Sabres were battling for make the playoffs, something the Bruins officially achieved last night by gaining the single shootout point. It should be said the Sabres are also due praise, for gathering with the Bruins after the game at center ice, and saluting the crowd, a classy gesture after a hard fought, crucial NHL match. After all is said and done, no detailed commentary required really. Just click on 'replay' and enjoy, over and over. Boston Strong. Damn right it is.